For years now, Sunday has been the day that I put aside some time to meal prep for the week ahead. If I’m being completely honest, I haven’t always been the biggest planner in other aspects of my life. In a lot of ways, I’ve been a “fly by the seat of my pants” type of person, making decisions by following my gut. One of the biggest keys to staying healthy is meal planning and meal prep. And the good news is, this really doesn’t have to take a lot of time. I’ve created a 21-day meal plan that I use, with some variations if I feel like something different and then I spend maybe an hour or two on a Sunday prepping some things for the week ahead. With that being said, I thought I’d share 10 of the things I frequently do during my meal prep Sunday time. These are all great ways to save time during the week and will set you up for success. The first thing I do on meal prep Sunday is to meal plan. This is easy because I usually just follow my 21-day meal plan. Depending on how I’m feeling, I’ll follow the plan entirely, or I might switch it out with some other healthy recipes. This is the most important step because you need to know what you’re going to be eating so you can make a grocery list and figure out what needs to be prepped for the week and what can be done on the day. Once I’ve worked out what I’m eating and made a list, I’ll go to the store and buy everything then come home and start prepping. The first thing I’ll do is bake some boneless, skinless chicken breasts in the oven. This saves a ton of time during the week. While it’s super easy to bake chicken breasts, it does take time for them to cook. Alternatively, I’ll cook them in the slow cooker (I have no real rhyme or reason for this, it just depends on what I feel like. Also, chicken breasts cooked in the slow cooker are easier to shred, so if you’re making recipes with shredded chicken, the slow cooker is a good idea. 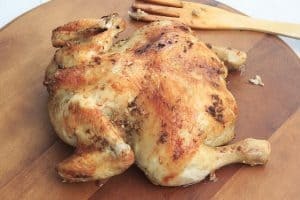 In my 21-day meal plan, I have some meals that use a whole baked chicken. I hate baking a whole chicken, so I just buy a pre-cooked one. Cooked quinoa stays good in the fridge for about a week, so while the chicken is baking, I’ll put a big pot of quinoa on the stove top. I eat a lot of quinoa and love it, because it’s so healthy and versatile. It can be eaten savory in place of rice, and for breakfast with a bit of almond milk, fresh berries and a drizzle of maple syrup. Sometimes I’ll also cook a pot of brown rice, however I usually just buy the microwave packets of brown rice that take 90 seconds to cook. It works out more expensive than buying rice in bulk, but I like the convenience and the fact that I don’t have to store large bags of rice in my small kitchen. I just chop all the veggies, place them on a large baking tray, drizzle some coconut oil and a little sea salt and cracked black pepper on top, and then bake for around 50 minutes at 400 degrees. This is one of my favorite meal prep Sunday tasks, because I love roast veggies and it makes the week so much easier. I eat the roast veggies plain, toss them with some quinoa, put them in a wholemeal wrap, eat them as a side with some lean protein or even stir fry them with some sauce and protein. I’ll then put a bit of hummus in the bottom of a mason jar and stick some chopped veggies into the hummus. This makes it super easy and convenient to just grab and go. Sometimes I’ll also make mason jar salads, just by arranging some quinoa, chickpeas, chopped veggies and a chopped boiled egg in a mason jar. Make sure you don’t add the dressing until you’re ready to eat your salad, because the salad will get soggy. Mason jar fruit salad is another great, on-the-go snack idea. Just wash and chop fruit like blueberries, strawberries, melon, watermelon etc., and add to a mason jar. Another healthy snack I love that satisfies my sweet tooth is protein balls, so I’ll often make a big batch of protein balls on meal prep Sunday. Add all ingredients in a bowl and mix until combined. Roll into balls and refrigerate until firm. Boiled eggs make a great, healthy, protein packed snack (I love adding a bit of sriracha sauce to mine.) 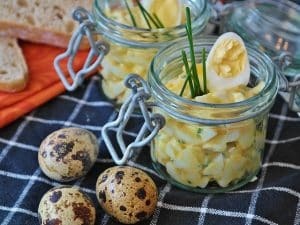 I also love having boiled eggs on hand to easily make egg salad and to add to a wholemeal wrap. I don’t actually boil my eggs the traditional way – I prefer to bake them in oven in their shells. Just preheat the oven to 350 degrees, place eggs in a muffin tin (in their shell) and bake for 30 degrees. Then remove from the oven and immediately plunge eggs into a bowl of ice water. Once the eggs are cool, peel and store in a container in the fridge. Smoothies are my favorite thing to have for breakfast – I have a healthy smoothie almost every day. To make things even easier, I will often make on-the-go smoothie packs. Just portion your ingredients into a ziplock bag and place in the freezer. Then in the morning, all you have to do is empty the ingredients into a blender, add some liquid and you’ve got a healthy smoothie ready in one minute. Chickpeas are one of the healthiest snacks you can eat. They’re a great source of protein, high in fiber and help to reduce blood sugar levels. Roasted chickpeas are delicious and super easy to make. Just drain and rinse a can of chickpeas, spread them out on a baking tray and season with your favorite spices. Then bake for around 35 minutes at 450 degrees. I’ve found that one of the biggest keys to making meal prep a success is to organize and store everything so it’s easy to see and access. I used to use a random array of containers and found that things looked disorganized, would get pushed to the back of my fridge or freezer and I’d end up having to throw things out because I forgot they were there. To avoid this from happening, I bought these Fitpacker meal prep containers. They’re great for portion control, freezer, microwave and dishwasher safe, contains no BPA, pthalates or toxins and they’re perfectly stackable so your fridge and freezer will be nice and organized. So there you go, that’s exactly how I meal prep on Sundays. If you have any other great meal prep ideas, leave them in the comments below!